Hi everyone. 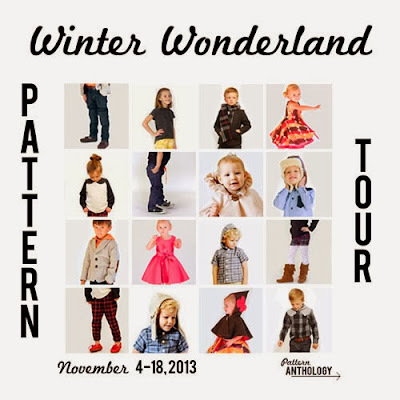 It's my turn on the Pattern Anthology Winter Wonderland Tour. No, it is not winter here in Australia, but I couldn't say to no to such a lovely invite and I selected a pattern from the collection that can be worn year round - The Sweet Bonnie top designed by Shauna from Shwin Shwin. If you've not heard of Pattern Anthology, it is a relatively new brand which is essentially a seasonal pattern collaboration by four great designers - Melissa, Shauna, Andrea and Kate. You can read all about the designers here. Each season, they release a new collection of patterns that are released together at a discounted price. After two weeks, each pattern is available individually in each of the designers pattern shops. Winter Wonderland is Pattern Anthology's third collection. I opted for an asymmetrical pointed peter pan collar to complement an asymmetrical button opening down the front of the top. I added a kind of 'flat piping' along the raglan seams. For this top I omitted the back zip as I felt it would not suit this remixed style. I also repositioned the pocket lower on the top. I do love the little peak of toddler tummy peaking through the button opening! The cream is a cotton jersey and the floral woven is a piece from Australian chain fabric store - Spotlight. I guess Spotlight is the equivalent of the American 'Joann's' from what I can gather. I have one down the road and am there at least once a fortnight. My store is huge and I love it. I can always find something great and at good prices. Since it costs quite a bit to have fabric shipped to Australia from the US, I buy lots of my fabrics from 'Spotty'! After I made Emily's top, I wanted to make The Sweet Bonnie top un remixed too. So I made this pale tangerine top for Isabella. And because I made one for two of my daughters, how could I not also make one for Juliette? We don't want anyone feeling left out! Isabella's tangerine stretch is from another Melbourne supplier and the collar/pocket is some fabric I stole form my sister's quilting fabric stash! Juliette's blue stretch is a bit heavy for this pattern but two out of three ain't bad! Her collar is a liberty lifestyle and the mismatched buttons are thrifted. I do love a good exposed zip and this pattern shows you how to instal one easily with good effect. I did plan on doing this photoshoot at the zoo but quickly took some of these backyard fence shots before we all headed off, just in case. When we got to the zoo, the older girls refused to remove their new zoo membership lanyards and with summer hats donned on a 25 degree (C) day, they were looking very un-winter wonderlandish! So the better shots of the garments are the ones I quickly took at home. There are eight great patterns in the Winter Wonderland bundle - four for boy and four for girls. Boys include a cool shirt/hoodie, blazer, awesome pants and funky earflapped hat. Girls includes a lovely twirly dress, sweet capelet, the sweet bonnie top and some groovy pants/shorts. I have half sewn the Berkshire blazer for Isabella (just because I have never made a blazer and wanted to have a go). It is almost finished but doesn't match this photoshoot so hope to post it in the next wee or two. You can opt to buy the patterns as gender specific bundles or as the whole lot. 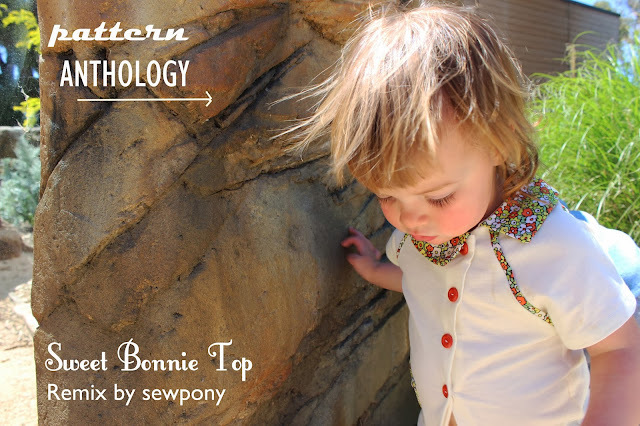 Click on the pic below to take you to the Pattern Anthology site! While you are there, you can see what everyone on the blog tour has made so far by checking out the Winter Wonderland gallery. I love what you've done with this pattern. I'm especially fond of Juliette's blue version. Oh so lovely! So, so cute!!! I love all of those. Great remix! Those are so so cute! I love the off-center collar, that's a great detail! How cute are these children! Love how the tops turned out, perfect for the summer. Love the floral accents on the cream top. So cute! It's so lovely to see all three of your girls together! What a lovely little gang. And yes, I know that feeling when a planned photo shoot just doesn't work. There's no negotiating with little girls! I've had high hoped of lovely autumnal leaf pix - and in the end it's back to the garden fence! They are all so cute. I'm loving the flat piping on the sleeve seams. So creative and a nice pop of color! And your daughters are so cute! Such little cuties! I love the floral collars. Love these! It's great when one pattern can be customized to each girl's personality. Thanks for being on the tour. That's adorable! What a great remix. I think I prefer the asymmetrical collar, now that I see it in action. That giant turtle is my favourite!! We always make sure to visit him:) Love the colours you have chosen for these tops Suz! I want all those tops for myself!!! I love all the tops...such great versions of the pattern! I think Juliette's is my favourite, the colour is beautiful! oh i love all three so much. The remix is really fun. You did such a great job, lovely colors and all. I wouldn't mind your winter over mine- any day! haha. The girls are all looking so grown up now, esp Emily! Love her top the best! Man-o-man... I love all three!!! But I have to admit... Emily's remix is SO cool. Brilliant job, Suz! adorable!! great fabric choices, I love it! I especially love that tangerine one. Also, your girls are really freaking adorable. Sounds like spotlight is the equivalent of our Joanns. We have a big one nearby and somehow I can rarely ever find anything I like. Le sigh.